If you want to be ready for winter storms and other disasters, keep in mind that prevention is better than cure. Being unprepared in these circumstances can leave you and your loved ones vulnerable to the force of nature. Winter storm preparedness can save numerous lives and property. Winter Storm Outlook – A possible storm is coming within 2-5 days. Winter Weather Advisory – This could cause inconveniences and you should be on a lookout for potential hazards. Taking precautionary measures is advised as the storm can also be life-threatening. Winter Storm Watch – A storm is anticipated to enter the vicinity within 36-48 hours. Winter storm plans should be in place and informed of succeeding information about the condition. Winter Storm Warning – The storm will enter the vicinity within 24 hours. 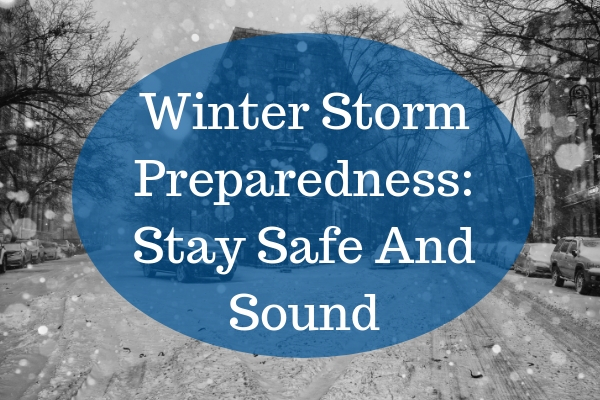 You should be on high alert and immediately take on precautionary measures according to your winter storm plan. It’s important to keep at least three days’ worth of water supply. If you have a big family, say five to eight persons, expect three gallons per person. Keep store food supplies that won’t stale easily. If you almost frequently experience winter storms, purchasing an NOAA Weather Radio would help you prepare ahead of time. Be sure to purchase with extra batteries and make sure it’s fully charged. Keep a shovel handy to clear out snow or dig yourself out in worse case scenarios. Purchase flashlights with batteries. Some candles with lighter (or matches) are also be needed. Prepare an ample supply of blankets to guard yourself against the cold should there be power outages. Inspect for roof leaks and clean the rain gutters. Some cooking may be necessary. Consider a butane stove that you can use safely indoors. Just make sure you’ll be cooking in a well-ventilated space (a cracked window or opened door would be sufficient) to prevent carbon monoxide poisoning. Some accidents happen because of a malfunctioned heater, hence leading to fires. It would be best to purchase a fire extinguisher. Anyone in the household should know how to use it. Stock up an ample supply of heat packs. Don’t stay on the roads. If you’re driving, move to a safe place and stay inside until the storm subsides. The extreme cold may make you vulnerable to hypothermia and frostbite. Add multiple layers of warm clothing. Overexertion is the trigger factor for a heart attack. If you need to shovel the pathway, get some rest in between. Check for signs of frostbite and hypothermia and treat immediately. Water pipes can get clogged when temperatures hit below 25 degrees Fahrenheit. Turn on every faucet such that it’s barely dripping. You can also keep your thermostat high during nighttime. This could add additional costs to your bill but it keeps the pipes from freezing and repairs later on. Should there be a blackout, unplug all electrical equipment to prevent the accidental fire from a power surge. If you use a generator, take all precautionary measures and safety clothing to prevent electrocution. Keep updated with the news. The surfaces can get slippery so having a kitty litter or sand on hand will provide traction. Drive only when it’s necessary to go out. Keep indoors until the storm has totally passed. Safety is your priority. If there are chemical threats, listen to the radio for further instructions on places to go. The home safety check is necessary after a winter storm. If you have children, it’s best to leave them with a relative or friend. Look for outside damages. This could show further damages inside such as loose power lines, gas leaks, or missing support structures. Have a professional look into these if you’re unsure how to proceed. The storm may leave your home with some roof damages. Using tarps provides a temporary solution to roof damages. Tarps could get slippery even if it’s dry. It’s best to roll the tarp over the damaged area while standing on the ladder or roof. Always follow ladder safety precautions and don’t stand on the topmost part of the ladder to prevent imbalances. With tarps, you will have enough time to contact water damage restoration professionals to check the water pipes. Have a reliable air mover on hand to dry wet surfaces and extract water to speed up the drying process. It might be best to purchase a battery-powered air mover in case of power interruption. When you prepare for the worse, you can weather through the storm. If local stations announce a winter storm coming, a checklist should be an ideal ‘primer’ so you get your essentials and household preparations in order.